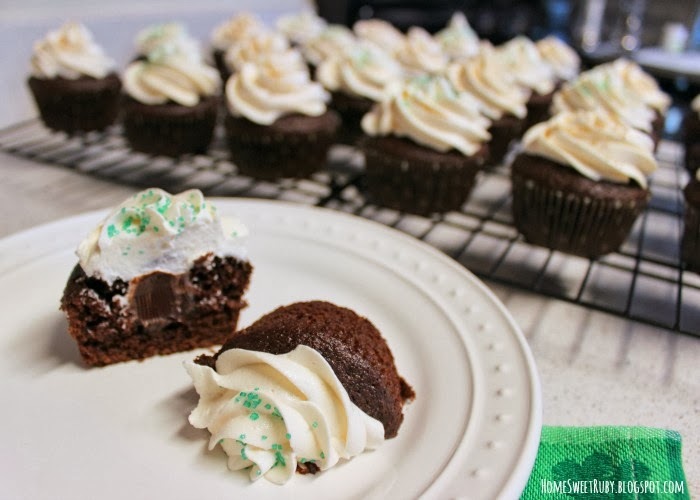 This weekend was so busy, but I managed to make my favorite St. Patty's Day treat in between all of the packing, cleaning, and dinner with friends. I can never resist the urge to bake with booze. I don't know what it is that I find so interesting about it, but these cupcakes have easily become a St. Party's Day tradition in our household. I've made them 3 years in a row, and after changing the recipe a tad, these were my favorite yet. Even if you're not a big fan of an Irish Car Bomb in drink form (like me) there is still enough chocolatey goodness that makes them so delicious! The flavors are pretty mild, but feel free to add more whiskey or more Bailey's if you're into it. And no, you won't get the least bit drunk eating these. Sorry to disappoint! These are more complicated cupcakes because you're making a filling. If you like to bake and are good at following recipes, you'll be fine! 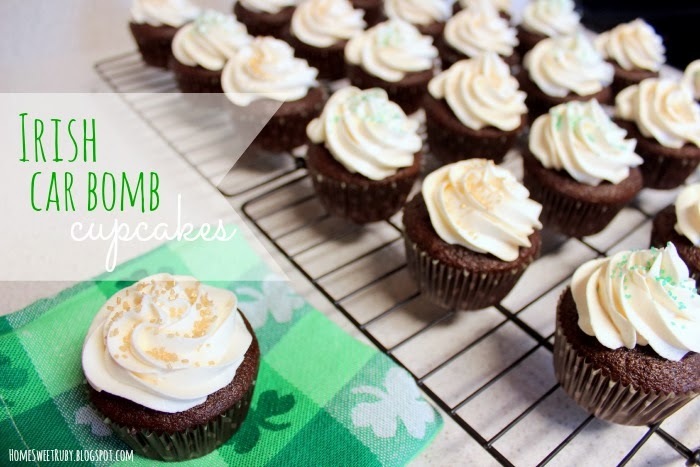 If you're not up for making everything from scratch, I found this recipe where you can use boxed cake mix with the Guinness. I may actually try that next time! 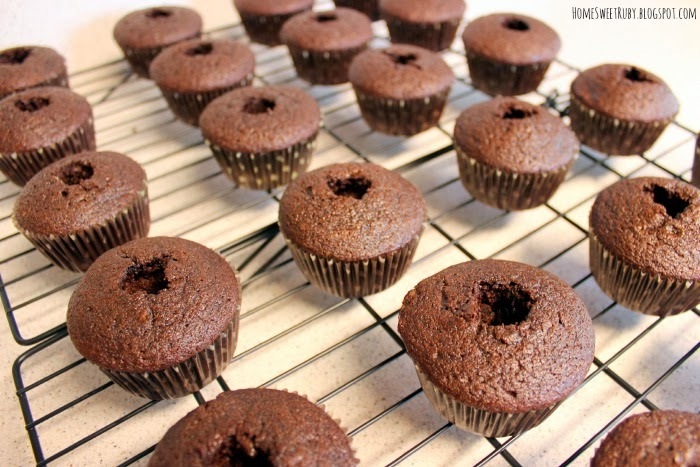 To Make the Cupcakes: Preheat your oven to 350 degrees F and place liners into your cupcake tin. In a medium pot, bring the Guinness and butter to a simmer over medium heat. Lower your heat and add the cocoa powder, whisking until smooth, and then let it cool slightly. Some of the beer may separate for you, no worries! Whisk the flour, sugar, baking soda and salt in a large bowl, and set aside. Using a mixer, beat the eggs and sour cream on medium speed. Add the Guinness mixture to the egg mixture and beat just to combine. Reduce the speed to low and gradually add the flour mixture. Divide the batter among the cupcake liners. (I use a cookie scoop like this). Bake until a toothpick comes out clean, about 16-18 minutes. Let the cupcakes cool on a rack. To Make the Whiskey Ganache Filling: Chop up the chocolate and place in a heatproof bowl. On the stove in a small pot, heat the cream until it is simmering and pour it over the chocolate. Let it sit for one minute before stirring with a rubber spatula. Add the butter and whiskey and stir until combined. Let the ganache cool until it thickens, about 15-20 minutes. 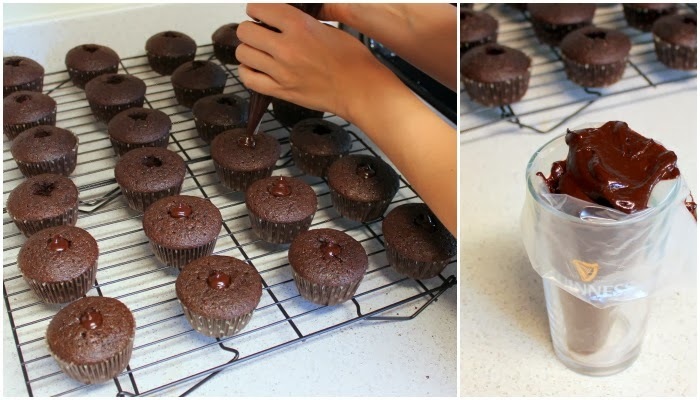 To Fill the Cupcakes: Using the bottom of a decorating tip, the handle end of a spoon, or a random item in your junk drawer, cut the centers out of the cupcakes after they have cooled a bit. You want go about two-thirds of the way down. Fill the holes to the top with the ganache using whatever method works best for you. I used a piping bag without a tip, I just cut the edge of the bag. It doesn't have to be pretty but it will taste amazing! To Make the Baileys Frosting: Using the whisk attachment of a stand mixer, whip the butter on medium-high speed for 5 minutes, scraping the sides of the bowl occasionally. Reduce the speed to medium-low and gradually add the powdered sugar until all of it is incorporated. Add the Baileys, increase the speed to medium-high and whip for another 2 to 3 minutes, until it is light and fluffy. Frost the cupcakes and decorate with sprinkles. I used a Wilton 1M tip for these cupcakes. Then eat! I told you this was a little complicated, but I promise all of your friends will be so impressed that you baked beer into a cupcake! Anyone have other boozy recipes I should try?! I once tried Champagne Cupcakes but those were a total fail. 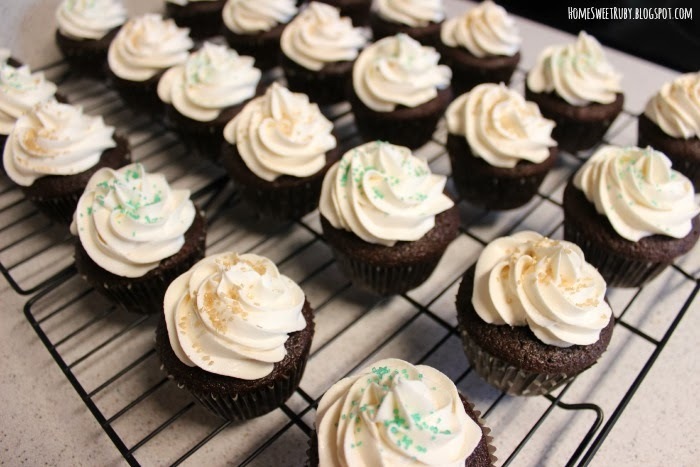 Thank you for sharing what tip you used to frost them! Details are important. They look super cute! These are so great!!! You could totally mix and match the flavors too! Love! Those are so cute. You are officially a professional baker I'd say! These were so amazing!! They truly tasted like bakery quality and not homemade. I'm craving one just thinking about them!! These are so festive and fun! These are fabulous! They would be a major hit here in Dublin!